Last month was delicious with Tasty Palettes.I expected and received several delicious entriesSeveral taste testers showed the admiration for dear Suganya ,some cooking more than one which definitely is a great way to show how much they enjoyed the food.Without any delay lets see who all entered the party and what they brought along. Delicious appetizer of eggplant bake, and also goes -with- anything tomato pesto with walnuts. Then comes Rekha of Plantainleaf with carrot muffins which in her words require no changes and are perfect in measurement. Divya Kudua of Easycooking was happily lost among the delicious pictures and admiringly baked banana muffins which she made eggless and added choco chips. Trupti of Recipecenter also made the delicious banana muffins which she made eggless and added almonds. A&N of reluctant chefs cooked up the chilled Cucumber Soup and she tells us she regrets not eating cucumbers before. Followed by Almond Pate almonds being her favourite. And a comforting and traditional plate of Venpongal and gosthu which she enjoyed at lunch. Pepper Garlic and Cumin Rasam with roasted potatoes. KC of Kitschow brings in a healthy BrownRice bowl.She finds several recipes that fits lent in TastyPalettes. Hema of SalttoTaste presents a piping hot bowl of Kadambam rice as well -she had to grind the ingredients to make podi but the effort was worth it. Ashwini of Spicy Cuisine presents a delectable side dish of Cabbage Mor Kootu which goes well with rices as well as rotis. Usha of MySpicyKitchen sends us savoury Corn Muffins which she enjoyed for lunch and also dinner. Susan,the Well Seasoned Cook,sends in MorKali -South Indian savoury riceflour and buttermilk pudding which she enjoyed for breakfast and lunch and whats more, thanks to precise microwave instructions by Suganya,she actually started using the microwave. Madhu of Ruchi sends in Spicy Corn Muffins which are simple yet delicious she says.And whats more she made them eggless too. Jayasree of KailasKitchen sends us tangy melt in the mouth Lemon Poppyseed cookies which was a bookmarked recipe and obviously a keeper recipe. Spicy Dal with roasted vegetables. Zlamushka says she has "learned from Suganya that complicated looking dishes are so simple and you cannot go wrong with them "and this round up proves exactly that. wow this is truly amazing. great round-up and some incredible new links to try. thanks for including my contribution. Great yummy round up..lovely style !! Lovely Round up . Thanks for hosting this lovely event. Waiting for ur entry for CFK:Rice event. 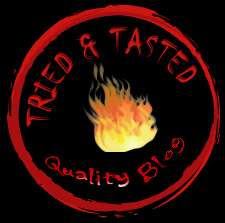 Very nice roundup..I have bookmarkrd tasty palettes to try more..good work curryleaf..
Thats a delicious round up with loads of yummy dishes...I enjoyed trying n participating T&T...great work CL..
Great round-up all her dishes are delicious! great round up, good job!!! soo many wonderful entries!! Really very nice to see so many of Suganya's lovely recipes here. A terrific tried & tasted! Great round up. The dishes look so good. I am truly honored by the graciousness of the food blogging community. I have personally thanked all the participants, but if I had missed anyone, accept my thanks once again. Sweatha and Zlamushka, this is job well done. I am humbled. Thank you! Thank you very much, Sweatha, for this yummy round-up. Lots of hard work and it shows. TP is one of my many favorite blogs.